Coity Church has a central tower, with six really nice easy going bells. There are also clock and sanctus bells. 5 Bb 34¼ 89.2 7½ 381.8 IN HOC REGNO MONARCHA "JOHN LEYSHON, CH.W." It is not known when bells were first installed in the tower. 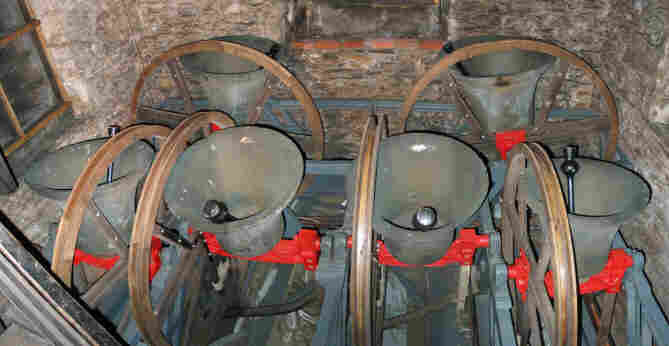 In 1722 there were four bells recorded. These were taken down and repaired in that year. One more bell was added the following year, 1723. The bells were originally rung from the ground floor at the crossing, from behind the then choir screen. In 1726 the five bells were taken down and recast into a six by Evan and William Evans, Bell Founders of Chepstow, the only ring of six cast by them. This must have been costly, for sometime later the firm from Chepstow threatened to sue the Rector for non-payment of their bill. On each bell is a quotation in Latin, on the treble is the name of the founders and on the 5th is name of the churchwarden of that time, John Leyshon. The bells were idle, like so many, during the second world war. In 1952 the bells were refurbished by Gillet and Johnson of Croydon and rehung in a steel frame, less their cannons and cast-in staple. The tower was re-roofed at the same time. They were refurbished again in 1999 by Nicholson Engineering. Coity people have always been interested in their bells. There are quite a number of references in old parish records to repairs of ropes, wheels, the annual pint of oil, and liming interior tower walls together with the claims for the cost! For "ale and our trouble". "William Moss Churchwarden" & "Tho=Gardiner Fecit 1757". The cannons and cast-in staple were removed, and it was hung dead above the bell frame and is used as the clock's hour bell.